Large files sometimes take a long time to download or open, which can be frustrating. To make matters worse, if the file contains images, this can slow the process down even more. When you optimize your PDF document you enable easier opening, uploading and downloading of your PDF files. In this article, we'll outline some tips on how to optimize PDF documents with the best PDF optimizer - PDFelement. While there are many tools that offer optimization solutions, not all of them necessarily offer you the best results. This is why you should consider using PDFelement as your number one PDF editing tool. Apart from offering you plenty of PDF editing features, it is the best tool to use when optimizing your PDFs. The image quality of your document will not be compromised, and you will not risk having your file hacked because you had to upload it online. Powerful conversion tools give you the possibility of repurposing your documents. The OCR tool lets you convert documents that were previously scanned into editable digital documents. Password protection can help you protect from unauthorized viewing, modifying and printing of your document. You can add both text and image watermarks to your document to enhance document ownership, control, and security. You can merge or split PDF files to manage and organize your PDFs in a better way. 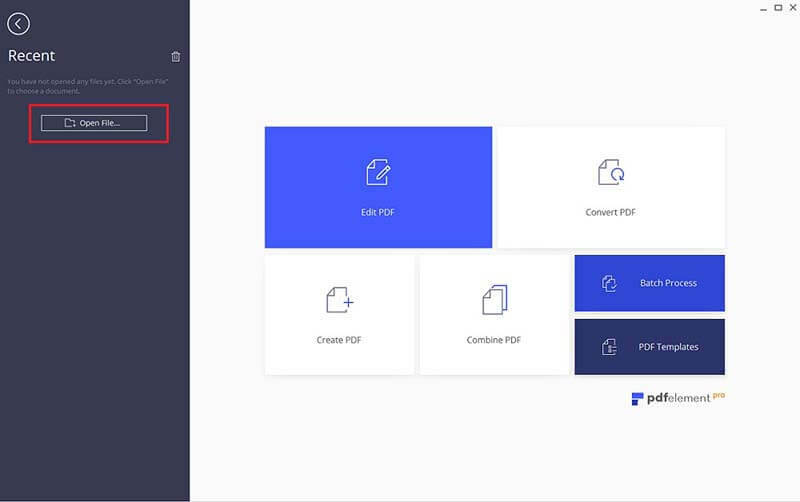 Launch PDFelement and click the "Open File" button to upload your PDF. For Mac users, you can import your PDF by clicking the "Open File" button. Once the file is open, click on "File" and select the "Optimize" button. A window will appear with the following choices: Web ready (smaller size); Office ready (medium size); Print ready (larger size); Custom. Choose the option that best suits your current needs. For custom compression, another window will appear requesting you to specify the quality and size with which you wish to optimize your document. Once satisfied with the adjustments you've made, click "Optimize". 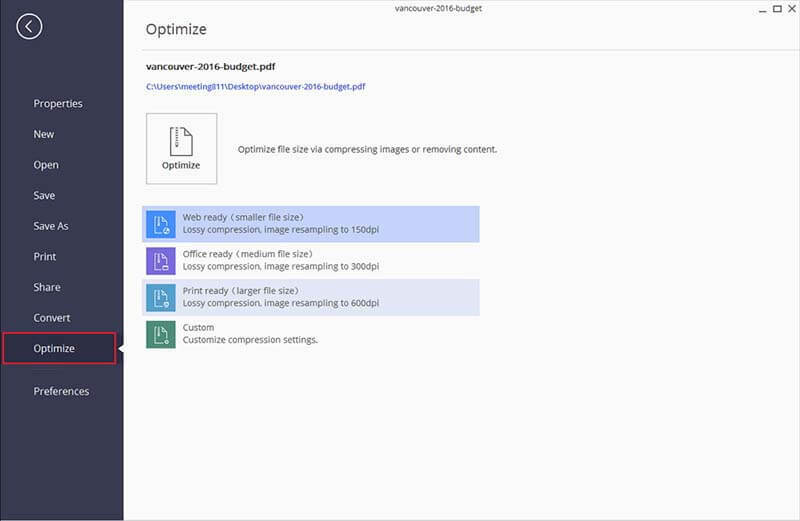 This online optimizer lets you browse through files on your device, or to drag and drop them into the program. Following a few prompts, you will be able to optimize your document. However, note that while you optimize you will have limited features. You must pay to access all the features available for your PDF editing needs. You will also need to register with the site to start using their services. This is another optimizing tool. While using this program, you must ensure that your combined PDF files do not exceed 60mbs. You can perform batch processing of up to 50 files at one time for the ultimate convenience. If you want to resize your document, however, the quality of the images will be compromised. The smaller the file size, the less clarity you will get with your document. This program also offers PDF optimization. However, you need to have Adobe Acrobat Pro installed to work with it. You may also lose some of the features from your original document, like thumbnails, comments, or highlights, among others. This is because as it optimizes, it discards a lot of extra features on the document to make it smaller. While many online PDF optimizer tools are offered as "free", many of the features may be missing until you buy them. Most online PDF optimization tools require you to register, meaning you have to keep logging in when you are optimizing or using online tools. Some of the processes are so complex that you may need extra resources or an advanced knowledge of PDF editing to understand how to properly optimize your document. Most people are afraid of working online with sensitive or confidential data because it could be breached. Online optimization does not give you 100% assurance that your file is safe. Therefore, there is a safety risk when you use online tools. There is also usually a limit to the amount of data you can process online and the quality of the output. An internet connection is required to use any of these programs.